Mt Krizevac is a Holy place of prayer and silence. Respect other pilgrims and do not disturb them in prayer. At the top by the Cross pray in silence. Descend in silence. Do not disturb those climbing up and praying. DO NOT BUY OR SELL ANYTHING ON Mt KRISEVAC. Do not light candles anywhere on Mt Krisevac. Do not litter. 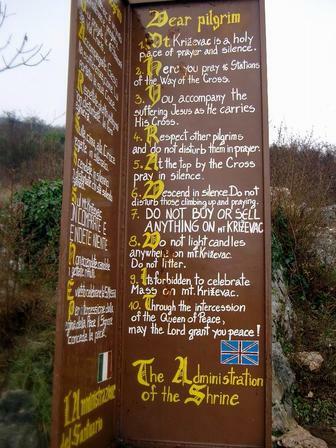 It is forbidden to celebrate Mass on Mt Krisevac. Through the intersession on the Queen of Peace may the Lord grant you peace. The Administration of the Shrine.